Try this unique crispy shrimps balls that you can cook anytime. It is so simple that you don’t have to be an expert cook or chef to make these. One unique feature of this shrimp balls is, it is coated with crispy vermicelli noodles. A very nice and presentable dish. 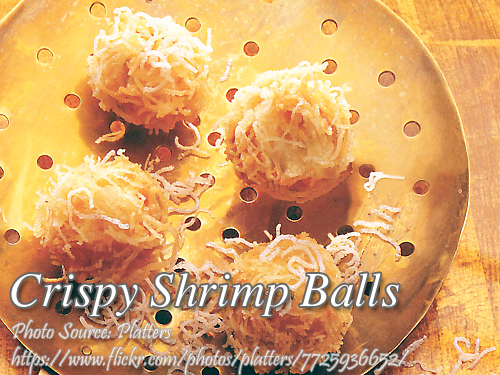 To cook crispy shrimp balls; Mix and blend the shrimps, pork fat, flour, salt, pepper, egg, and water chestnut. Form 2 teaspoons of mixture into balls and arrange in a baking tray refrigerate for at least half an hour. Soak bihon noodles in water for 1 minute. Drain. Spread on a platter. Roll shrimp mixture in bihon noodles until balls are formed and well coated. Deep fry in hot oil, a few balls at a time, until golden brown. Drain on absorbent paper towel. Serve hot with sauce. To make sauce; Boil all ingredients except pineapple chunks. Stir until thick. Add chunks one minute before removing from heat. Hello! I really like your recipes. Any replacement for this pork fat. I’m currently residing here in Saudi and as you know pork is a no-no. Hi Riz, never thought of substituting pork fat with anything else on this recipe. Maybe you can use duck fat or beef fat.